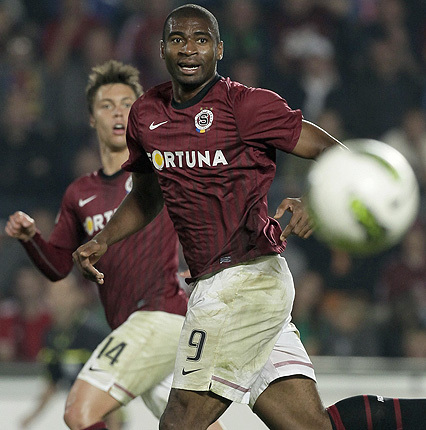 Begrudgingly, you have to admire what Sparta Prague has achieved so far this season. They have come out of the traps like a scolded cat, 9 wins out of 9 in the league with a goal difference of +19. If this was Viktoria Plzen, Jablonec or Mlada Boleslav everyone would be waxing lyrical about the perfect start being made, but because Sparta are as likeable as a bout of Hepatitis C they are not getting the praise warranted. The Spartans also play a very direct and aggressive style of football, relaying on the passing of abilities of Matejovsky and brute strength of Leonard Kweuke. But maybe now they have a 10 point lead at the top of the Gambrinus Liga they might start to entertain as well as bulldozer teams off the pitch. Naturally Sparta Prague has the strongest squad in the league, and it’s not a real surprise they sit top of the league. Main rivals Viktoria Plzen are having difficulty stretching their squad over domestic and European duties, and bitter neighbours Slavia Prague are in a massive hole right now. The nearest challengers appear to be Jablonec and Bohemians 1905 but I expect their challenger to fade away by spring time. Sparta coach Martin Hasek is gradually forcing out the older generation of players and integrating a new youthful look about the team. Repka, Blažek and Sionko have all found their playing time restricted and players like Svenger, Krejci, Husbauer and Kadlec are becoming the new face of Sparta Prague. In the recent 3-0 victory over Pribram Kadlec scored his first league goal in 11 months and was named man of the match “It was a pleasant surprise for me; I guess I got it for the first half. Because after the break it was not so good, I was quickly running out of power” said Kadlec after the game. Let’s not forget about Leonard Kweuke, in the Cameroonian Sparta have the best striker in the league. In terms of talent and ability Kweuke is literally head and shoulders about the rest in the Czech Republic. I wouldn’t be surprised to see him leave in the January transfer window should Sparta receive a sizeable offer. But, this shouldn’t affect their chances of winning the league, Sparta should be so far ahead at the top of the league, the nearest challengers will need binoculars to see them. It could also work as a positive in terms of the style of play, no longer will they be looking to lump forward to the big man but maybe they will adopt a more attractive passing game? But knowing Sparta, they probably have another 6ft+ African monster of a striker on their wish list ready to replace the inevitable departure of Kweuke. Just as long as there isn’t another Tomas Repka waiting in the wings, then Sparta may just become a bit more likable.